I made a more “dainty” version of my turquoise necklace for my dad’s friend, Patty. Components: faux leather cord, brass beads, crystals, glass beads, and dyed imperial jasper stones. She loved it! 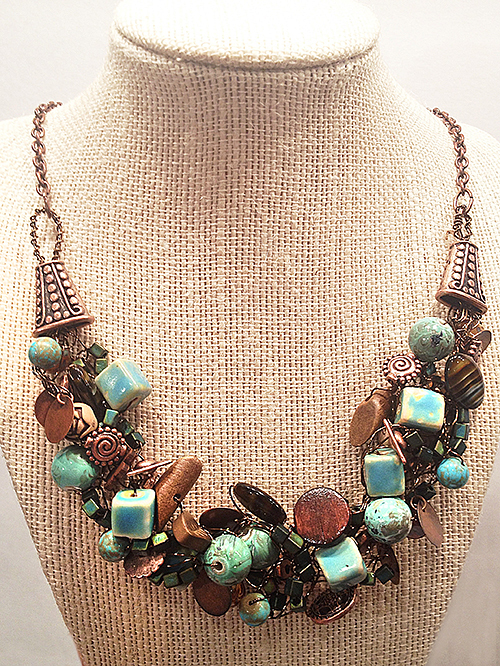 Here’s the second boho (bohemian, hippie style) layered necklace I created. Components: faux leather top cord, brass chains, painted jasper stones, rhinestone charms, and ceramic, resin, and glass beads. I’ll be making many more of these to sell in my online store (details to come soon!). My sister Debbie and I recently tried our hands at making necklaces using cheap metal washers of various sizes, alcohol inks, and acrylic sealant, and finishing off with assorted beads and cords. Not too shabby for our first attempts! My friend Camilla and her sister Cathy started a ring-swapping tradition years ago that has grown into a fun collection for both of them. Read all about it in the winter issue of Celebrate Home Magazine, still available for digital download in the links below. Click on either of the links below to download your FREE pdf copy of this issue. The first links is for single-page viewing (perfect for printing off your favorite recipe! ); the second link is set up for “reader spreads,” so you can see the magazine in spread format (my favorite!). Click here to view on issuu.com. 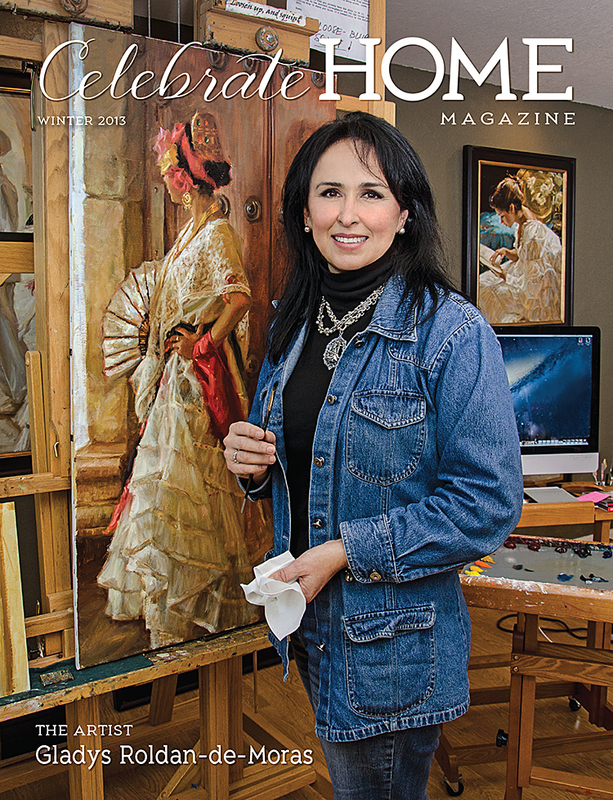 Design, layout, photography and interview by Cindy Dyer. All rights reserved. Winter 2013 issue of Celebrate Home Magazine now available for digital download! The winter 2013 issue of Celebrate Home Magazine is now available for digital download in the links below. Click on either of the links below to download your FREE pdf copy of this issue. The first links is for single-page viewing (perfect for printing off your favorite recipe! ); the second link is set up for “reader spreads,” so you can see the magazine in spread format (my favorite!). The more clicks we get, the better we do with promoting and getting advertising! We thank you for your support. Winter-inspired lovelies for you and your home. Easy on the eyes, the Hedstrom house takes advantage of light-filled views with clean lines and engaging color. Living the Fairy Tale: To Quit or Not to Quit? Mothers share their struggles with jobs and families. Take the chill out of winter with our filling soup recipes! Pair wine and desserts for elegant and easy entertaining. Create a cookbook that cherishes family recipes. Beer aficionado Jefferson Evans explores the world of seasonal brews. Always proud of her Colombian and Mexican roots, this artist’s passion is reflected in her colorful work. Stay indoors to photograph nature this winter. Think you’re ready to add a furry friend to your family? Here are some things to consider. Discover five tips for decorating your walls with original art. What started as a gift exchange between two sisters expanded into a beloved collection of rings. Give your rings a new home with our easy craft project. Categories : art, Cooking, Crafts, decorating, Design, dogs, entertaining, family, Flowers, Food, Furniture, graphic design, HOME, Interior Design, Jewelry, Oil Painting, Photography, portraits, publishing, SHOPPING! Last weekend during my beading birthday bash I created this cuff bracelet for my friend Dawn. 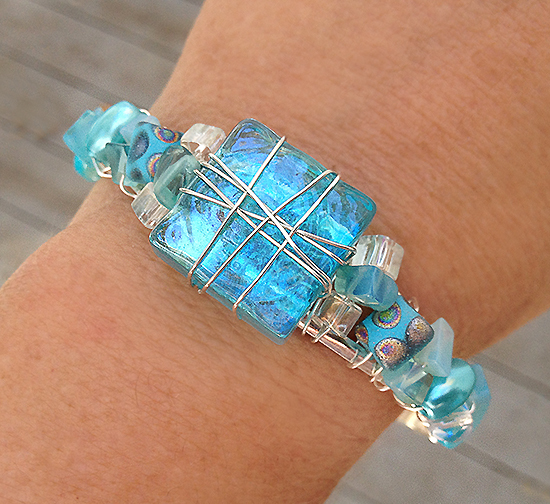 I used a blank wire cuff, 24 gauge non-tarnish silver wire, and an assortment of beads in various shades of blue. The star of the show was a piece of inexpensive square glass—the kind you get in bulk bags to fill vases. You can buy the bracelet blanks at Michael’s in a two-pack for $2.99 (you’ll get one of these and another style that I haven’t found a use for yet). I just discovered they’re available in a blackened-silver and a bronze color, too. It’s an extremely easy project and takes an hour or less to complete!